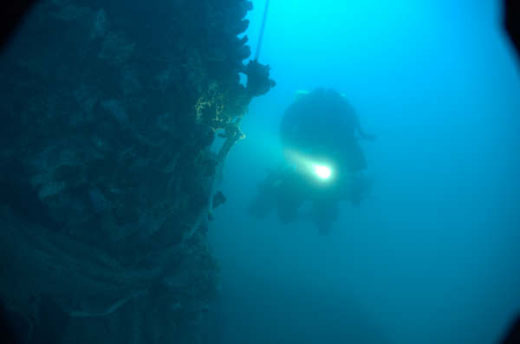 Editor’s note: Jamie Macleod and Stewart Oehl from TechThailand discovered the last resting place of American WWII submarine USS Lagarto in May 2005 at the request of the SubVetsWW2 Association. The submarine lies somewhere in the Gulf of Thailand and only Jamie, Stewart and the US Navy know its exact location. 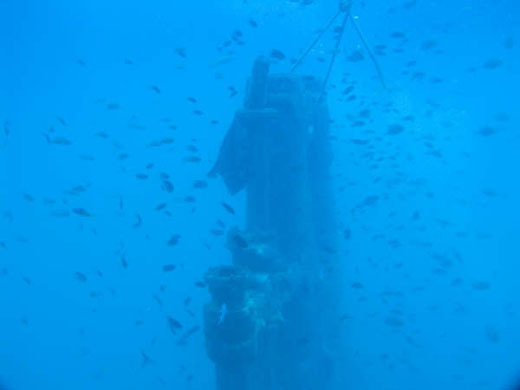 The US Navy formally verified the wreck as the USS Lagarto in June 2006. The Lagarto is a war grave and is therefore treated with utmost respect. 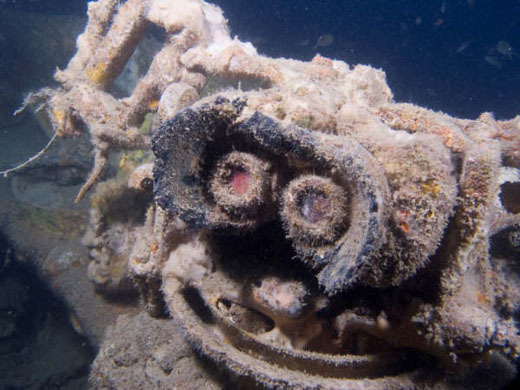 Jamie and Stewart have the permission and continuing support of the families of those who died on the Lagarto to continue diving on the wreck in order to try and learn more about it. 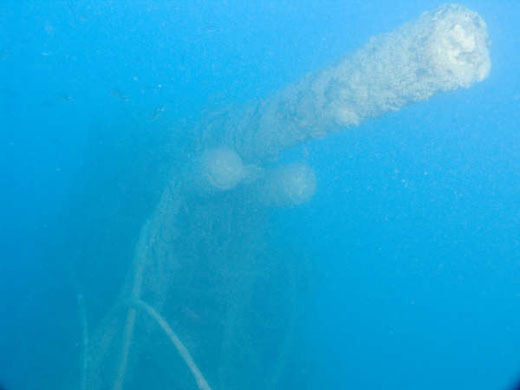 It is forbidden to penetrate or disturb the wreck’s remains in any way. Its secret location and its depth at 75 metres (around 250 feet) means that it remains offlimits to virtually all divers. 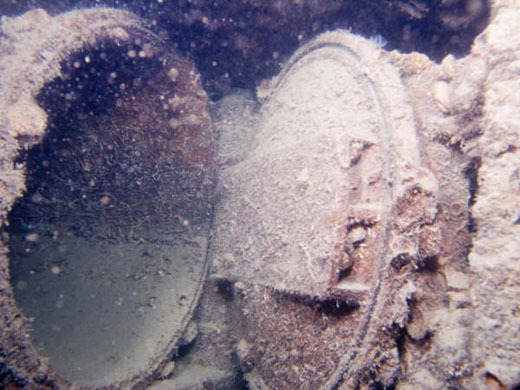 Deep Sea Detectives John Chatterton and Richie Kohler have also dived with Jamie and Stewart on the wreck- you can read my interview with Richie Kohler about the USS Lagarto. Here is Ayesha’s account of diving on the Lagarto with Jamie and Stuart on a subsequent research dive. I have been fortunate enough to dive all over the world and see many many different sites underwater from those overrun with sharks and rays of every description to the metal graveyards of battles passed but nothing took my breath away like the sight of a conning tower teasingly poking its periscope shears through the thermo clime. On the 3rd May 1945, the Japanese destroyer Hatsutaka reported a depth charge attack on a US submarine. US Navy records show that USS Baya and Lagarto were attacking the convoy that the Hatsutaka was vigilantly guarding. The USS Baya was not able to re-establish radio contact with the USS Lagarto and it was assumed that this was the depth charge responsible. The USS Lagarto has to be a once in a lifetime dive. A respected war grave, she lies in 73m of water in The Gulf of Thailand and only accessible to those with deep water training and experience. Only recently re-discovered – I can only begin to imagine the keenness and intensity of feeling when the USS Lagarto revealed herself to human eyes for the first time in 60 years. Dive trips leave from Koh Tao and are limited, but those lucky enough will be awed by her distinctive shape, silent guns and bridge complete with target data transmitter, telegraph and target sight. Descending down a line into very deep yet clear blue water is a feeling that has to be experienced to be understood. You are immersed in deep blue aware only of your breathing and the lure of what lies beneath. Surrounded by jacks schooling in translucent blue water, watching the USS Lagarto’s form appear, is something any deep diver will find exhilarating. Emerging, periscope shears and conning tower first she’ll draw you into her history – a truly unforgettable dive. In a simple 20 minute tour you can easily acquire over an hours decompression schedule and she is best explored in sections. A whole dive can be spent exploring her conning tower and immediate area which exhibits the bridge complete with all her gadgets plus mute guns and by dropping to port side you will see the fatal depth charge damage. Journeying to the bow for the irresistible purpose of gazing up at her immensity will reward you with sealed escape hatch, anchor, dive planes and torpedo tubes en route. Check the starboard side for proof of her tenacity to the last. The stern compensates the adventurer with colossal twin propellers, more guns and the US Navy memorial. She has only been dived a handful of times by very few and each dive reveals something new to the team. Guns, anchors and instruments were found and noticed for the first time during my plunge into history and I feel fulfilled to have been part of this historic process. The team see themselves very much as caretakers – curators if you will – of this piece of history and fiercely protective. I left feeling confident that she would be respected and tended with the esteem she deserves. Without doubt the most supreme dive. The satisfaction I felt can only be rivaled by the gratification taken by the families of those lost – finally understanding their loved ones last moments and final resting place. The shot had landed close to the bow in 73m of water, shrouded in nets but in one piece the 100m long Balao class submarine’s outline was indisputable. Her submerged holes permitted a spectral light to pass through her phantom-like form, yet in the silence of their awesome discovery Jamie and Stewart would swear they heard her fight and spirit across time. USS Lagarto was officially identified by both her location and her unusual 5 inch guns mounted fore and aft of the conning tower. Damage to the port side indicates she was indeed hit by depth charge. The position of her dive planes and rudder show that the sub had made a hard dive to port in her final moments – a classic evasive maneuver and an open torpedo tube supports the suggestion that she went down fighting. These facts gave closure to the families of the veterans and only served to increase the pride they had in their loved ones. A private family ceremony was held over the site just 2 months after her rediscovery with a formal memorial with full military honors held in Wisconsin 10 months later. Indeed the US Navy met with MV Trident over the site to formally recognize the USS Lagarto, memorializing the lives of the 86 servicemen lost. 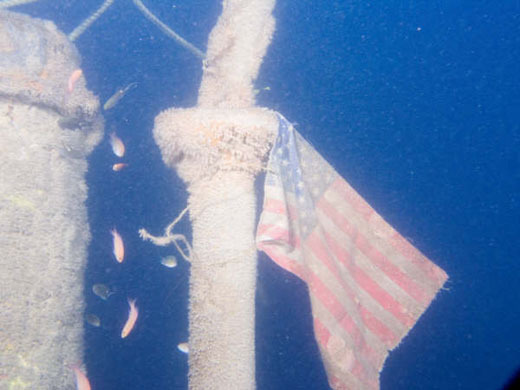 The brass plaque and flag can still be seen on the wreck today. May they rest in peace.